Freedom FP Fertility Pharmacy and Inside Rx are working to connect patients to more affordable and specialized fertility care. Newly added therapies may now offer more affordable access to drugs for the treatment of cancer and nasal polyps. 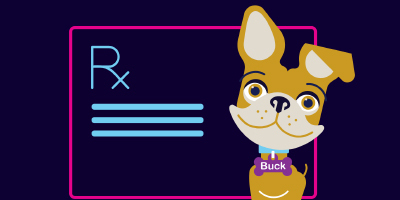 Medications commonly prescribed by veterinarians are now deeply discounted through Inside Rx. Express Scripts members and customers of the Inside Rx prescription savings program that provides discounts on medications to people who are uninsured or underinsured can choose to fill their medication at one of these MedCenters. The Inside Rx card will offer discounts on medications to help the estimated one-third of veterans who are uninsured or underinsured afford their prescription medications. Inside Rx celebrates its first year of providing deep discounts on more than 125 brand-name medications for Americans who are uninsured or pay out-of-pocket for their prescriptions. Added medications offer discounted treatment options for infection, migraine, overactive bladder, attention deficit, seizure and thyroid disorders; expands the program's offerings for heart disease and depression. Saratoga County, effective Tuesday, is partnering with a new firm to reduce prescription drug costs for under- and uninsured residents. Express Scripts sees a booming market in processing pet prescriptions from dogs, cats and other animals, projecting potentially millions of claims from cash-paying pet owners. Leslie Achter, CEO of Inside RX, talks about a new Spanish version of the app to find discount prescription drugs. Inside Rx announced the addition of 30 new brand-name prescription medications to its featured medications list, bringing the total number of discounted brand medications to 100. Inside Rx is helping more people access savings to prescription medications today with the launch of a Spanish-language version of the company's website. Veteran businesses like the benefit manager Express Scripts, recently helped to start a subsidiary aimed at cash-paying consumers. Inside Rx adds 18 new products to discount list; saves Americans more than $1 Million since launch. ESRX’s New INSIDERX Strategy – PART I: Cure for the Uninsured? Inside Rx will focus on providing access to certain chronic disease therapies at the negotiated price they are able to achieve for people without insurance, or for the underinsured. Express Scripts recently announced the launch of Inside Rx, a discount prescription program with savings ranging from 16% to nearly 80% for insulin and other diabetes medications. This innovative partnership is the latest attempt to offer direct-to-consumer discounts that pop the gross-to-net bubble—at least for uninsured patients. Express Scripts will begin offering a lower rate for a select group of drugs to people without health insurance, or to those who are stuck in plans with such high deductibles they couldn’t otherwise afford their medications. The nation's largest pharmacy benefit manager, Express Scripts, and eight major drug companies are unveiling a plan called Inside Rx, designed to lower out-of-pocket costs for brand-name drugs for those without insurance or with higher deductibles. Inside Rx, a new initiative from Express Scripts, partners with GoodRx, drug manufacturers and drug stores to save Americans an average of 34 percent at 40,000 pharmacies. INSIDE RX CARD IS NOT INSURANCE. Cannot be used by persons eligible for state- or federal-funded programs such as Medicare, Medicaid or Tricare to purchase Inside Rx featured medications, even if processed outside the benefit as an uninsured (cash-paying) patient. Must be under 65 to purchase Advair® HFA, Anoro® Ellipta®, Arnuity® Ellipta®, Breo® Ellipta®, Incruse® Ellipta®, Trelegy Ellipta, Flovent® Diskus®, Flovent® HFA. Cannot be used with any insurance benefit or copay assistance programs. Inside Rx Pets card is only for use with prescriptions written and dispensed for animals at a participating pharmacy. Inside Rx is not recommending or endorsing any pharmacy or drug, or providing medical advice. All trademarks associated with pharmacy and drug names are the property of their respective owners. 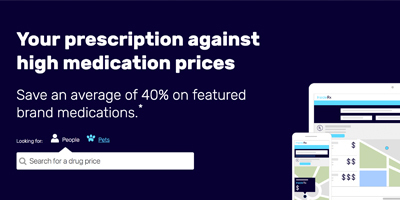 Because pricing shown online is subject to change in real time, Inside Rx cannot guarantee that the price you pay at the pharmacy will always be the price that is displayed in advance of purchase. See full terms.